A clear indicator that you are up to date with the latest lean thinking and practice. Reassurance that your competence is being continuously improved as a result of a range of learning and practicing activities. The creation of ‘lean habits’ in the way you organise your personal development. Having a robust mechanism to motivate, guide and direct you along your lean professional development path. Opportunities for learning, sharing and networking with other Professional Practitioners and organisations via the CPD network. Tangible elements of achievement and competence to display and communicate, including the LCS CPD certificate and badge. Professional Practitioners have access to a private forum to communicate with each other about any aspect of LCS CPD. A LCS CPD Handbook, providing a comprehensive guide to all aspects. Endorsement of CPD plans and evaluations. Examples of effective CPD, with commentaries on how individuals have progressed on their lean journeys. 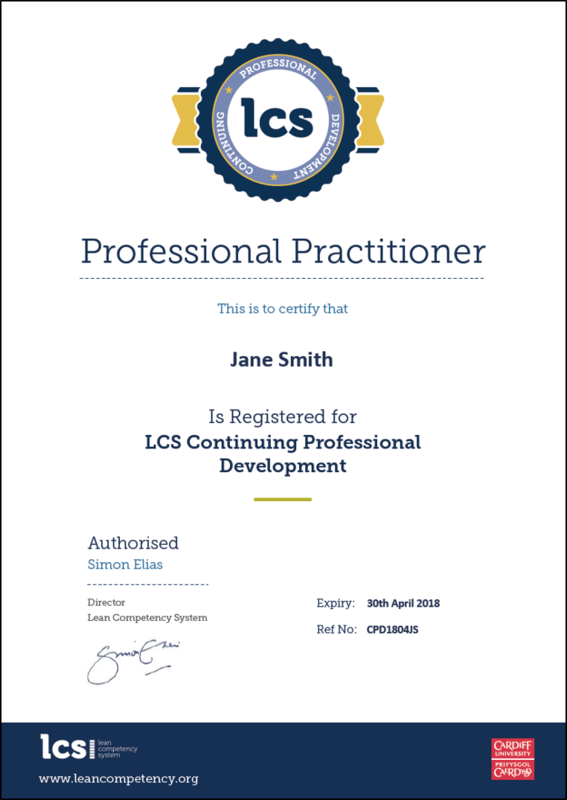 An LCS Professional Practitioner Certificate when registered, renewed annually. Frequently asked questions web page and discussion forum.